This month, your water bill seems excessively high. A further look shows a break in your underground waterpipe. To get to the source of the damage and complete major repairs, your front lawn must be excavated, leaving you with a massive ditch, exposed piping and an expensive bill to pay. Unfortunately, this could be reality for any homeowner. Underground service lines transport water, waste, heating, cable, internet and more to and from your house. A leak, break, tear, rupture or collapse can easily damage these underground pipes or wires, creating costly repairs and disrupting your daily routine. Homeowners are legally responsible for maintaining service lines from their home to their property line. And, standard homeowners’ policies don’t cover service line damage, which means you are on the hook financially for any damaged lines between the street and your house. This can potentially add up to thousands of dollars in repairs. Bridge the service line coverage gap. Like most homeowners, you may have received offers in the mail from utility providers sharing coverage options. And, like most homeowners, you may not be sure about the type of coverage you need. Many times, these contracts are limited in scope, cover only one service line and are an expensive alternative to coverage options through your insurance company. Adding underground service line coverage to your homeowners’ policy is a smart way to bridge this coverage gap and make sure you’re adequately protected for the future. The endorsement helps you cover costs for things like excavation, piping and wiring repairs and replacements, additional living expenses and landscaping repairs. Some carriers even offer additional benefits if you make eco-friendly or energy-efficient upgrades when replacing your equipment. You can’t always stop damage from impacting your service lines, but you can take necessary steps to prepare. By adding service line coverage to your homeowners’ policy, you can make sure you’re adequately protected and finally bridge the service line coverage gap for good. Talk to your independent agent to learn more about service line coverage. Grange Insurance offers an endorsement called Underground Service Line that you can add to your homeowners’ insurance policy. Contact your local independent agent for full details on coverages and discounts. If the policy coverage descriptions in this article conflict with the language in the policy, the language in the policy applies. What hazards and liabilities lurk within the four walls of an average home? Use Grange’s Interactive Home tool to explore potential risks and discover key home insurance policy options to help keep you protected. 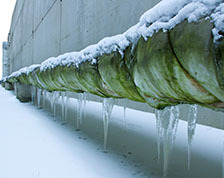 If low temperatures cause water to freeze inside pipes, pressure can build up and cause weak points inside the pipe to burst. Learn what to do if you ever have to deal with a pipe that bursts.